On July 2, 1921, the “Manassa Mauler,” Jack Dempsey, defended the world heavyweight title against the French boxer Georges Carpentier at Boyle’s Thirty Acres, a wooden arena built in Jersey City especially for the fight. Tainted by accusations that he had avoided service during the Great War (a jury had exonerated him), the American was hardly the favorite of the nearly 100,000 spectators. Instead, the crowd had been whipped into a frenzy of support for Carpentier, a popular World War I hero, whom George Bernard Shaw had called “the greatest boxer in the world,” and the enthusiasm was encouraged by the publicity machine built by the event promoter, Tex Rickard. It worked: the “Fight of the Century” generated the first million-dollar gate in boxing (more than $1.7 million, in fact). The bout was officiated by Joe Humphreys, the sport’s most famous announcer, who would preside over more than 20,000 matches during a storied career. And in the stands of this modern-day “Circus Maximus,” wealthy industrialists such as John D. Rockefeller Jr., William H. Vanderbilt, and Henry Ford mingled with famous celebrities, including singer and comedian Al Jolson, the flamboyant cowboy film star Tom Mix, renowned cartoonist Tad Dorgan, and authors H. L. Mencken and Ring Lardner. Enter Irvin S. Cobb, who was hired especially for the day by The New York Times to report on the Dempsey-Carpentier fight from ringside. During the first decade of the century, Cobb had become famous as the highest paid journalist in the country. He then secured his status covering World War I for the Saturday Evening Post; early in the war, he was captured by the Germans—and escaped. He later took up the cause of providing relief for black soldiers returning from the war and spent the 1920s fighting the Klan in Kentucky through editorials and activism. During the four decades of his writing career, he became famous for folksy stories set in his hometown of Paducah, for his humorous tales about the fictional Judge Priest (played by Will Rogers in the movie directed by John Ford), and for numerous screenplays and film appearances. In 1941 he published his final book, the best-selling memoir Exit Laughing. In spite of Cobb’s superstar status as a writer, Mencken brutally belittled the oft-voiced opinion that Cobb was the “heir to Mark Twain” and his writing eventually fell out of favor with readers. Today virtually all of his dozens of books and hundreds of stories are out of print. 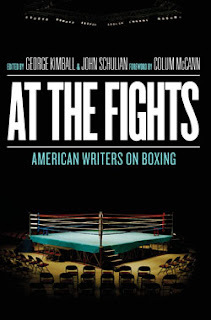 Cobb’s classic report from the Dempsey-Carpentier fight, offered in full as this week’s selection, is included in the forthcoming Library of America anthology, At the Fights: American Writers on Boxing, which has just arrived from the printer. It is recorded that, once upon a time, Aaron Burr, being challenged by Alexander Hamilton, bade Hamilton to meet him over in Jersey and there destroyed his enemy. Yesterday afternoon, also New Jersey history, in a way of speaking, repeated itself, which is a habit to which history is addicted. . . . If you don't see the full story below, click here (PDF) or click here (Google Docs) to read it—free! Wow! How do you follow that?